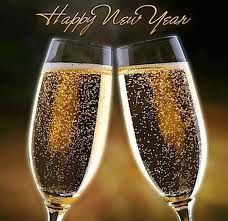 Happy New Year bloggers! Hope you had a festive holiday season and have big creative plans for 2011. I've got so many things I want to try, to create, and to accomplish on my list already. I'm about to burst! 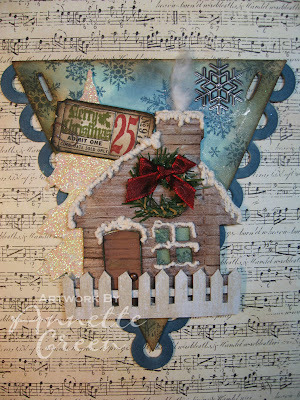 First on the list is the Stamp of the Month Blog Hop, which I am continuing to be a part of in 2011. We have some new members and some have left the group, so it's going to be interesting to check out the new and fresh artwork that's in store. Be sure to hop through the entire line-up because one of my consultants on my team, Tamra Pope, is toward the end of the loop (because she's a newbie) but MAN-OH-MAN wait 'til you see what this gal can do! She's amazing. So let's get going. If you are already hopping, you've come from Judy Burger's blog. I'm sure she's made something really beautiful. And don't forget to keep hopping after you've scrolled through my artwork below. The next link is listed there. The Stamp of the Month for January is called "Find Your Style." 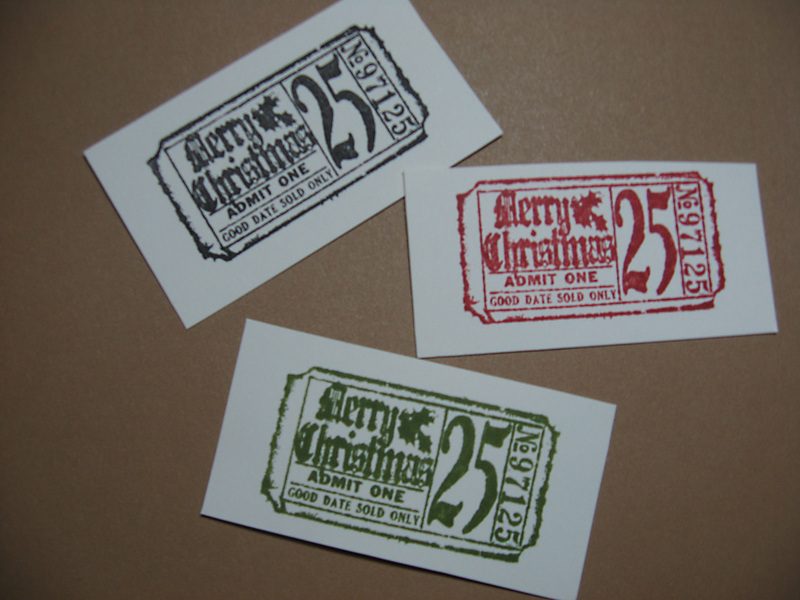 You can see an image of the full stamp set in the righthand column of my blog. It's so pretty! 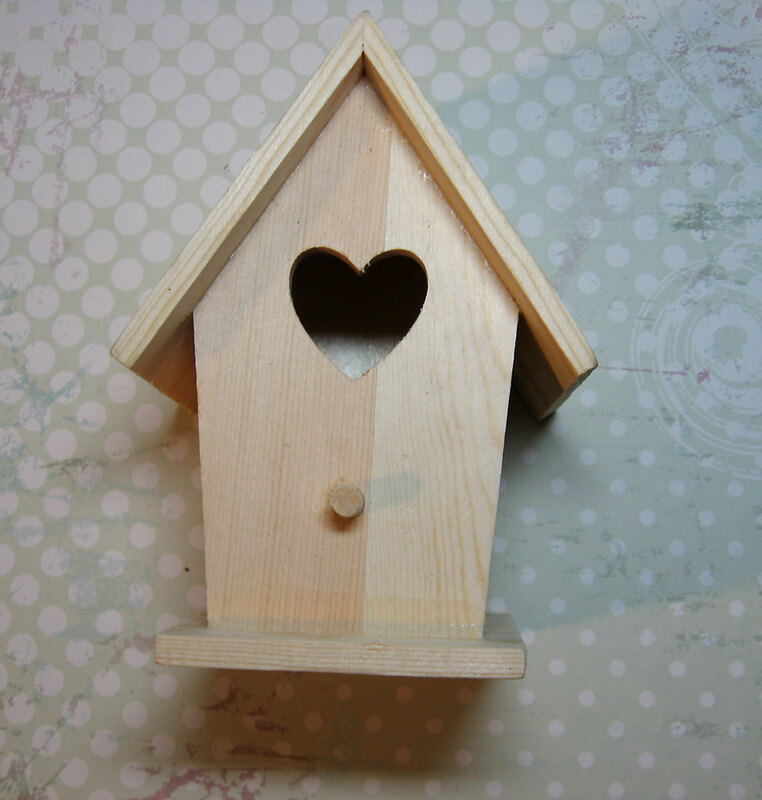 Once I got started on my projects, I didn't want to stop making stuff. But I controlled myself for now and will just have to make more later. For now, I have two projects to share. And this is the fun little project it turned out to be. I painted the whole thing with black acrylic paint first. 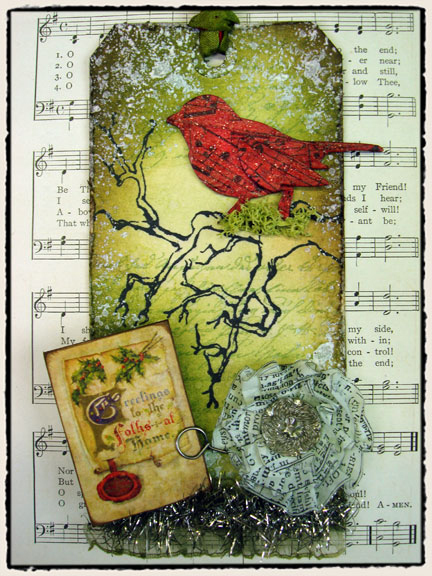 All the stamped images you see are from the Stamp of the Month, and the papers are from CTMH's newest paper pack "Wings". With the help of some Sweet Leaf ribbon, a Lagoon sparkle and some black waxy blax, this cute little house makes a perfect friendship gift. 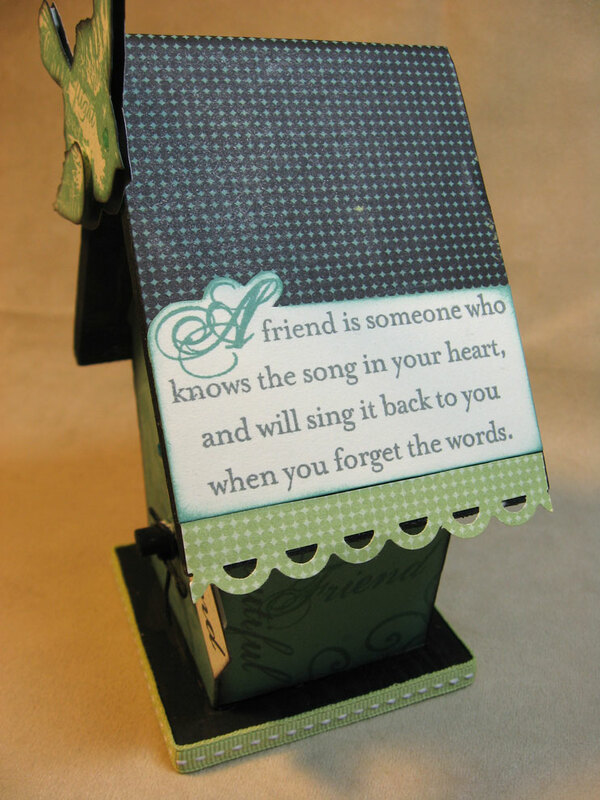 I really like the sentiment that comes in this stamp set, but it was a bit large for the front of the birdhouse so I just put it on the side. 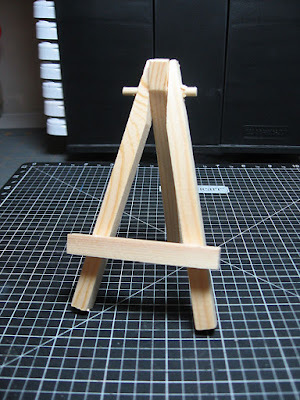 Using a masking technique, I stamped the words in Grey Wool and then the capital A in Juniper. And this is what it became. I knew I had to use that gorgeous butterfly and I'm betting the Blog Hop is going to be filled with lots of these. 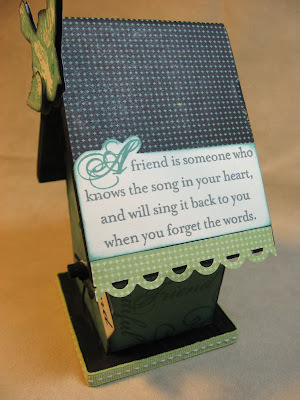 I love the text and the different fonts inside the image. I used a couple of ink colors to color the plain white canvas: Pacifica, Lagoon and Juniper. 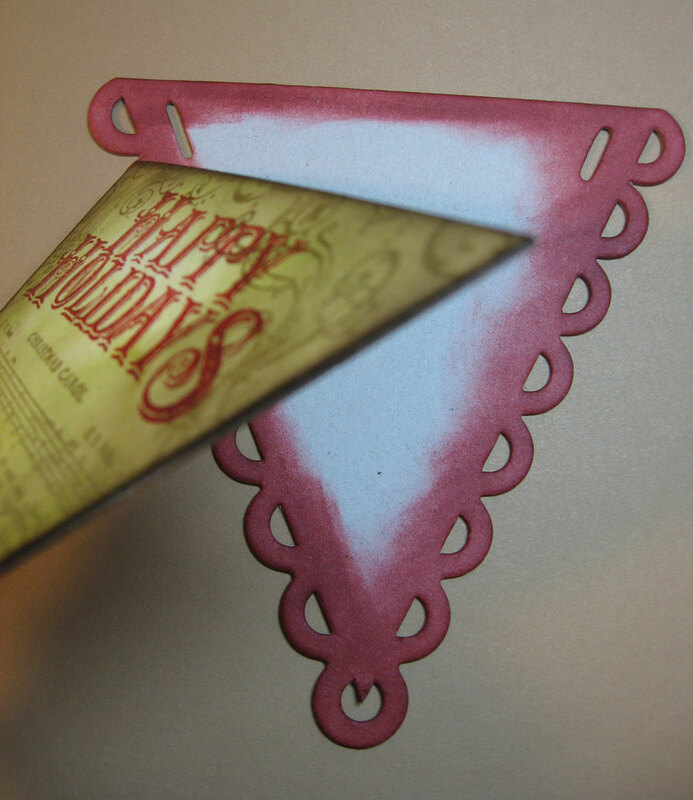 Then I used CTMH's new Spray Pen (3-pack for only $3.95!!) 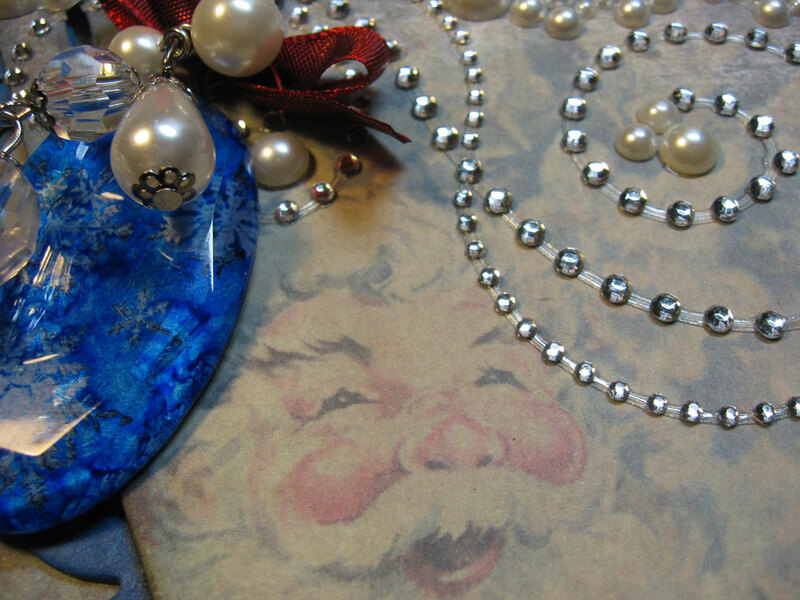 filled with water, Juniper re-inker and a few drops of Pearl Paint. I spritzed that over the canvas and, although it's hard to see here, it created these great droplet marks and the water lifted some color away from the canvas. If you click on the image you'll see it a little better. I added plain black grosgrain ribbon around the sides of the canvas, some dark blue wire for the antennae, and some black pearl opaques in the corners. 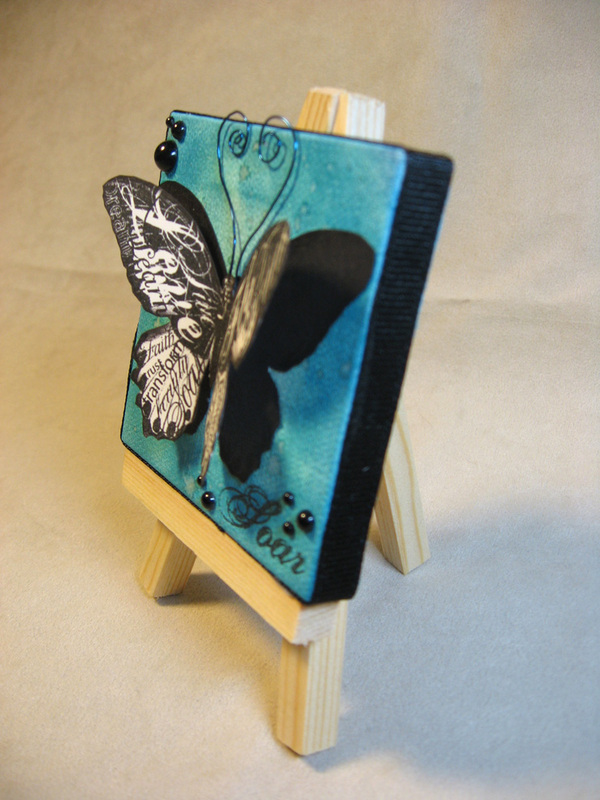 The butterfly is stamped twice with black ink. Once on Colonial White cardstock and once on black. The black serves as a shadow. 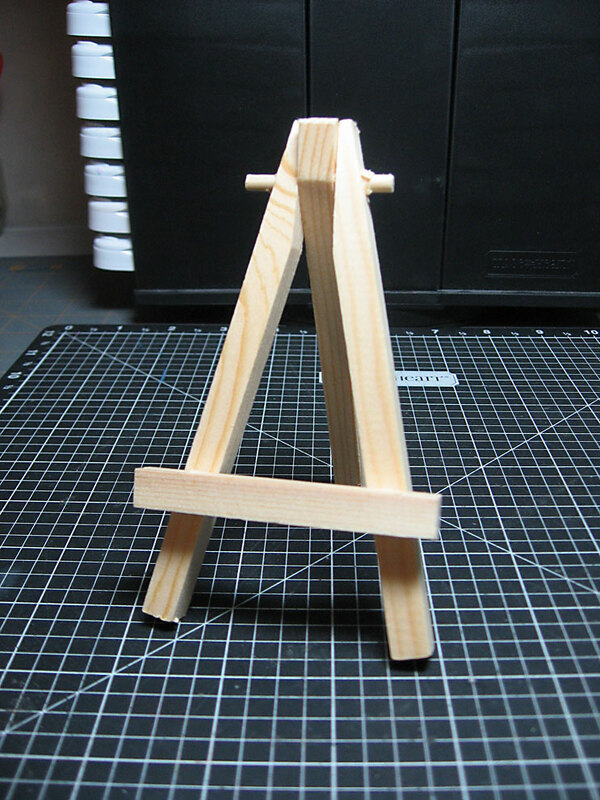 I finished off the project by gluing the canvas right to the easel. Thanks for stopping by. Now keep on hopping to see what Pamela O'Connor has designed. I can't wait to see it myself! 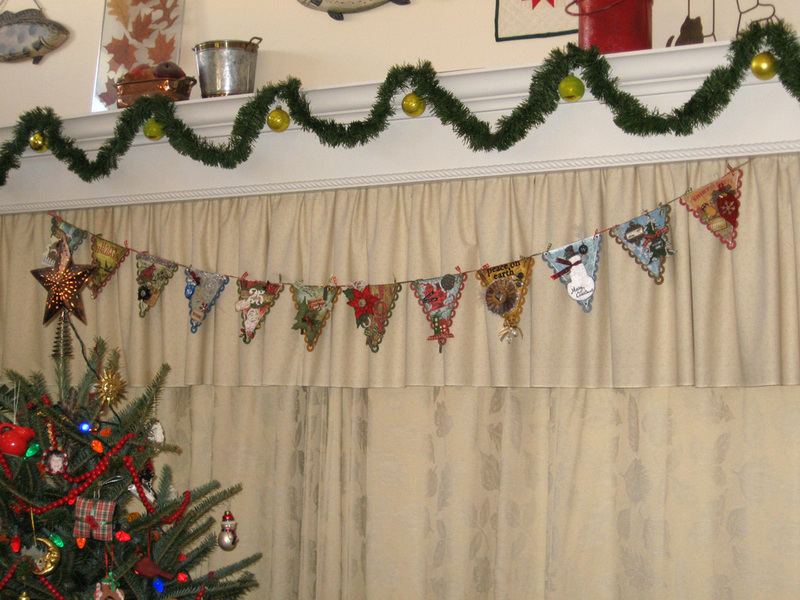 The banner is complete thanks to some red and green gingham ribbon to connect each pennant and strong jute twine to secure the ends. 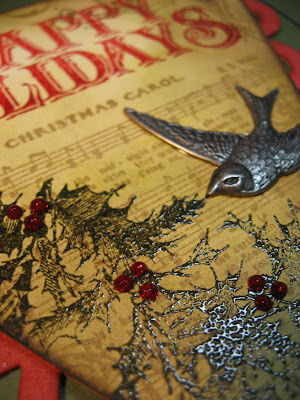 I've been fiddling with this video today and trying to get the final preparations for Christmas done. 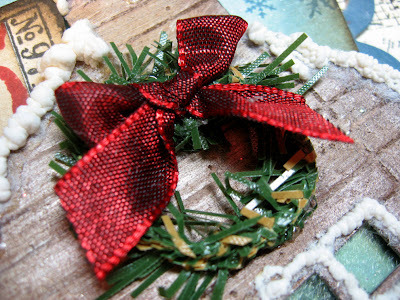 I hope it works and you are able to enjoy it in time for Christmas. 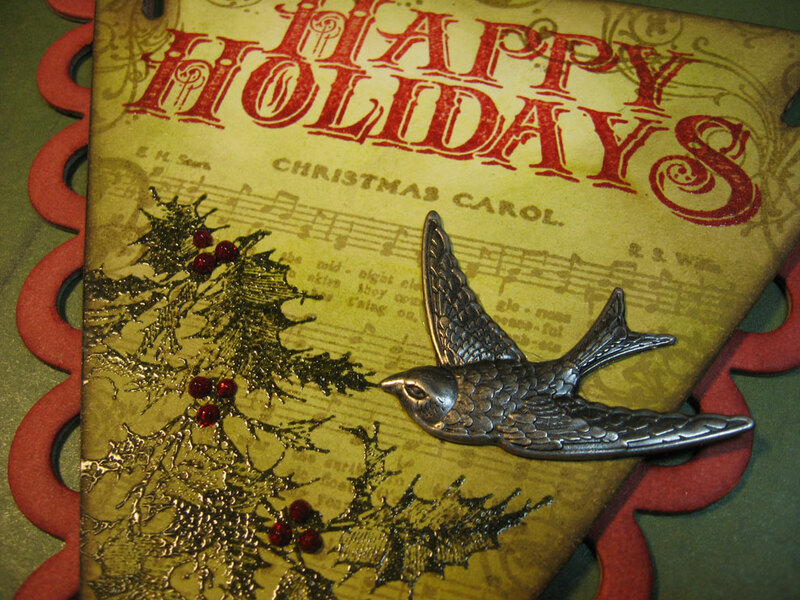 May you have a warm and wonderful holiday with loved ones. If it doesn't work for you, try my Mobile Me link instead. 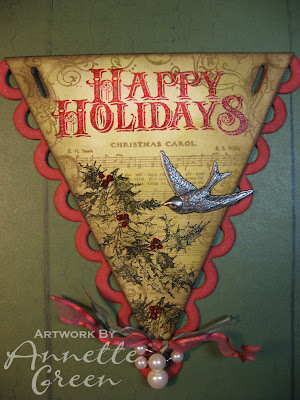 12 Tags of Christmas Banner from Annette Green on Vimeo. 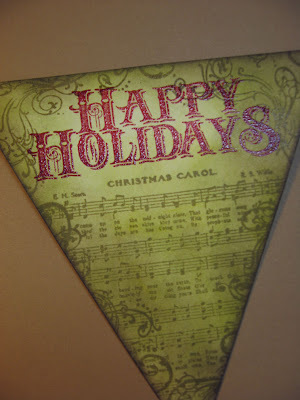 If you have been following along on my blog and my version of the 12 Tags of Christmas, you know that this is my final tag. 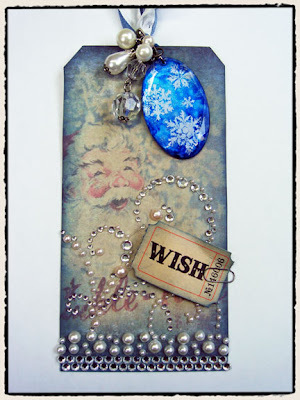 I started with tag #7 along with Tim Holtz, the inspiration behind my tags. I got a late start so after I completed tags 7 through 12, I started back at the beginning with tag #1. My tags are actually pennants that will string together to form one long holiday banner. I'll be sure to post a photo of the completed banner, assembled and hanging in my house when I am done. As I keep saying, you've got to go to Tim's blog and check out his step-by-step photos, techniques and videos he so generously offers us. I have learned SO much from playing along this year, as I did last year too. 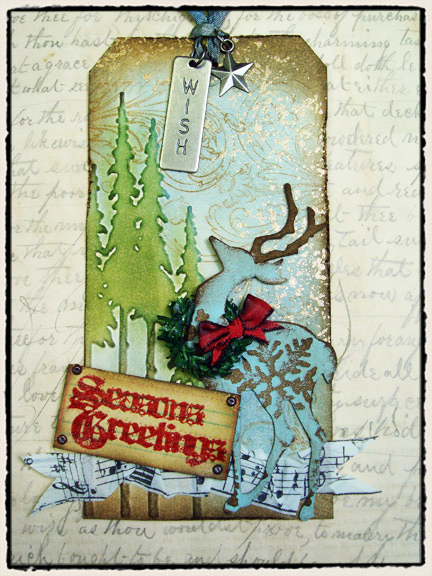 My favorite technique in this tag is his use of the snowflake texture fade on the die cut reindeer. So be sure to check that out. A little different take on the tag this time, especially with the color choice. I opted for a more traditional brown deer rather than the aqua colored one Tim made. (In this photo, the deer doesn't stand out very well, so be sure to click on the image for a better view.) I added a little aqua color to the embossed snowflake on the deer's body with a sparkly brad in the center. And while I really liked Tim's embossed trees on his tag, I didn't have that texture fade so I cut this tree from a die I had. I used some green felt rather than grungeboard to give it a little texture, but the felt was a little flimsy so I ended up gluing it to grungeboard after all. To back up a little, I wanted to mention that I used the negative space from the die-cut grungeboard to create a stencil effect for a background. It's fairly subtle in the photo, but helped give a little dimension to the main tree area. 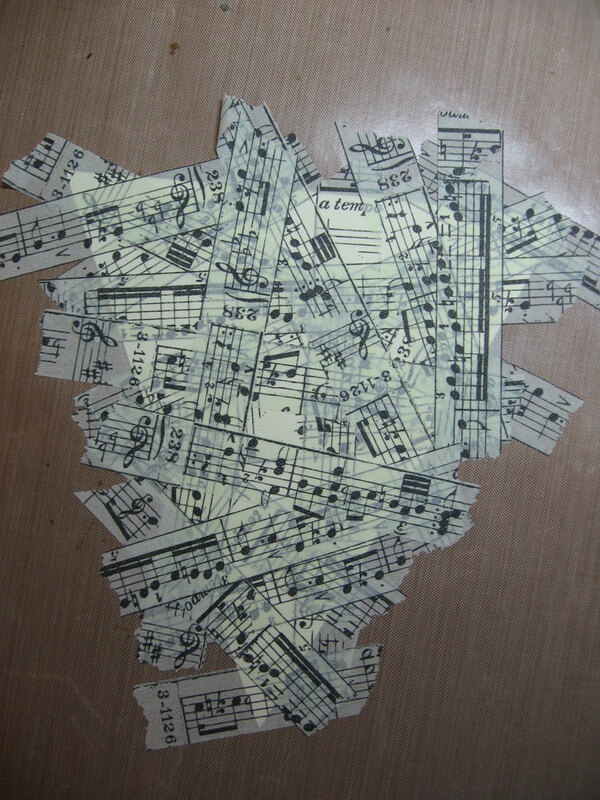 I'm pretty sure I stuck this musical note tissue tape upside down, but oh well, it's too late now. 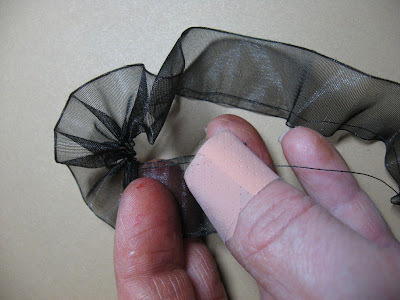 I like using tissue tape. It's fun stuff and easy to use. Here's another look at my tag. You might have noticed some splatters of gold on mine. I decided in the end that this one needed some flecks and since I didn't have that cool splatter stamp Tim used, I just spritzed all over with gold spritz. I thought I'd be sorry I did that, but I really like how it turned out. Thanks again for stopping by and checking me out. 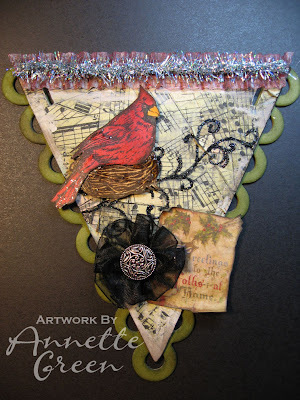 I've had such fun creating these pennants, and have learned a great deal along the way. I hope you have been inspired and learned something too. Much like yourselves, it's been a very busy holiday weekend around here for us. Three Christmas parties, a full day of baking, finishing Christmas cards, shopping, and wrapping. It's crazy, but fun for sure! The only problem was there was no time left to create in my studio. 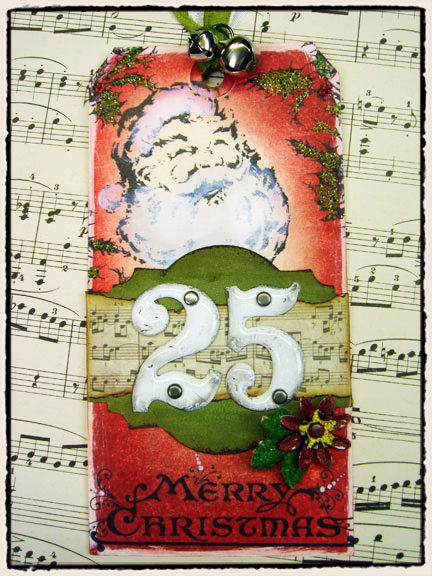 I kept thinking of my two tags left of the 12 Tags of Christmas inspired by Tim Holtz. I just couldn't find the time. Great, right? 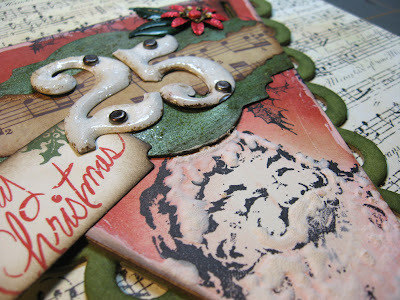 Be sure to go to Tim's blog and check out his step-by-step photos and techniques for this tag. Lots of good stuff there. Now here's my "tag" which is actually a pennant which will string together with the other 11 tags to make one big holiday banner. I had to make some slight alterations to my pennant since I didn't have some items Tim used. 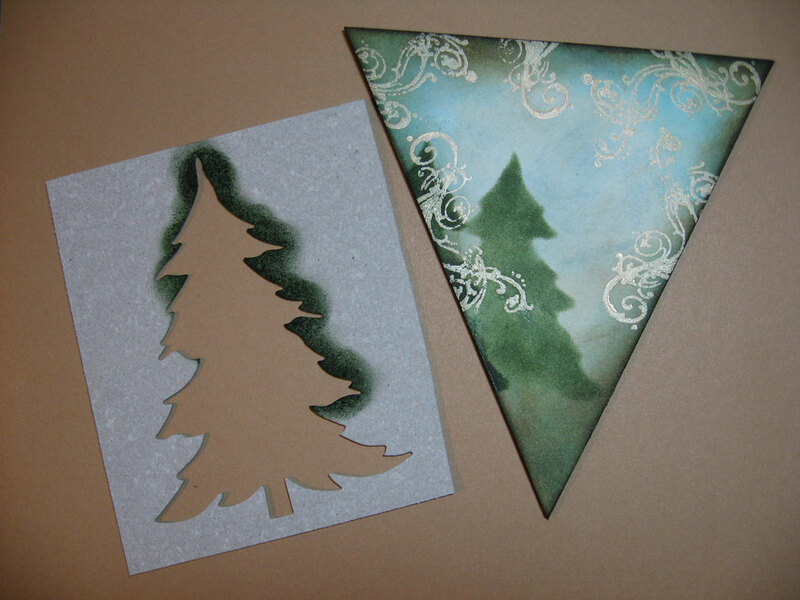 For example, I didn't have the green crackle paint so I tried a couple things. 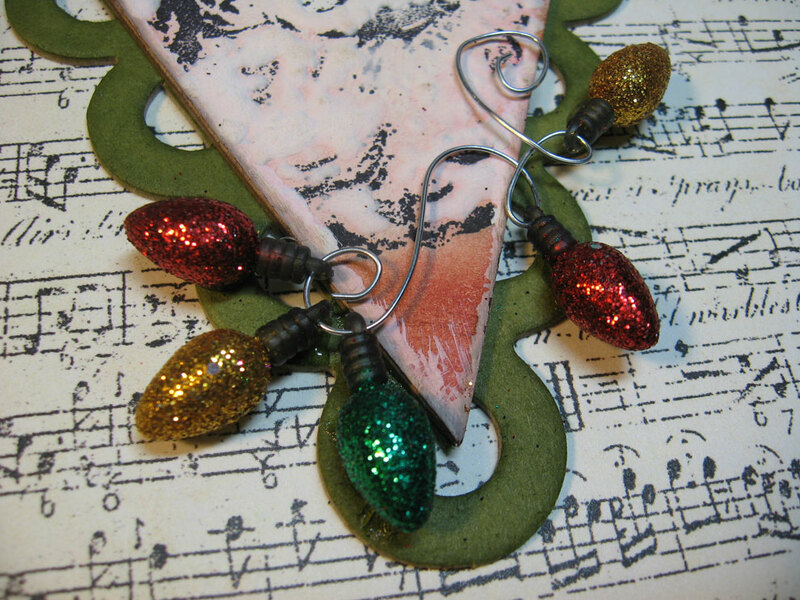 The first thing I tried didn't work and made the grungepaper label look like shiny frog skin. Tossed that one out. Then I did this one you see here by first applying Pearl Paint Dauber to the grunge, then inking with green distress inks, then Walnut Stain, then a final rubbing of green distress Stickles with my finger for some added texture. I didn't have Distress embossing powder either, but I did have regular green and gold embossing powder, plus some red tinsel embossing powder. It's amazing how this stuff still works on metal. I never knew! 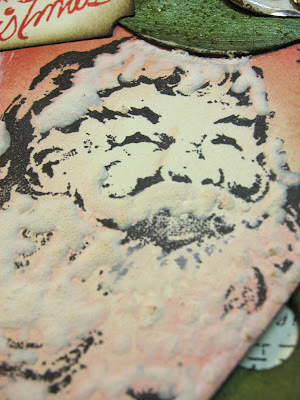 For Santa's beard, I opted to use my Snow Marker instead of the flocking stuff Tim used. (Sparkly Fluff, I think he calls it.) The Snow Marker worked great! Just write, dry, heat and it puffs lightly. Cool! For the metal numerals, I did just like Tim did and painted them white, then added Ultra Thick Embossing Enamel to get that thick, clear coating. Rather than ink-distressing with black, I chose instead to use some brown Staz-on on my finger and just rubbed it here and there, including the brads after I hammered them. 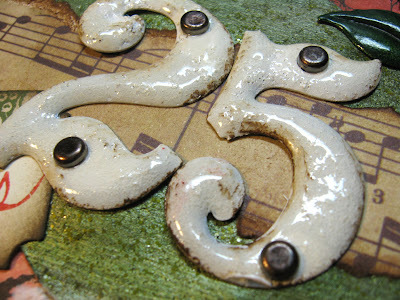 Here's another quick look at my Tag #5. I had the little bells like Tim used, but when I went to get them, I discovered these little Christmas light bulbs that I had picked up from the local craft store a month or so ago. I love these guys, don't you? Stay tuned tomorrow for my final tag in the 12 Tags of Christmas series. It's the Tim Holtz-inspired 12 Tags of Christmas, and although Tim has finished all of his, I am playing catch-up working on Tag #4. I started with Tag 7 alongside Tim, then came back to the beginning. Only two more to go after this one, and what fun I'm having! Like I've been saying for the past week and a half, you've got to go to Tim's blog and check out his tags. They're listed in the right-hand column. Be sure to click on his Tag #4 to see all his steps and details. 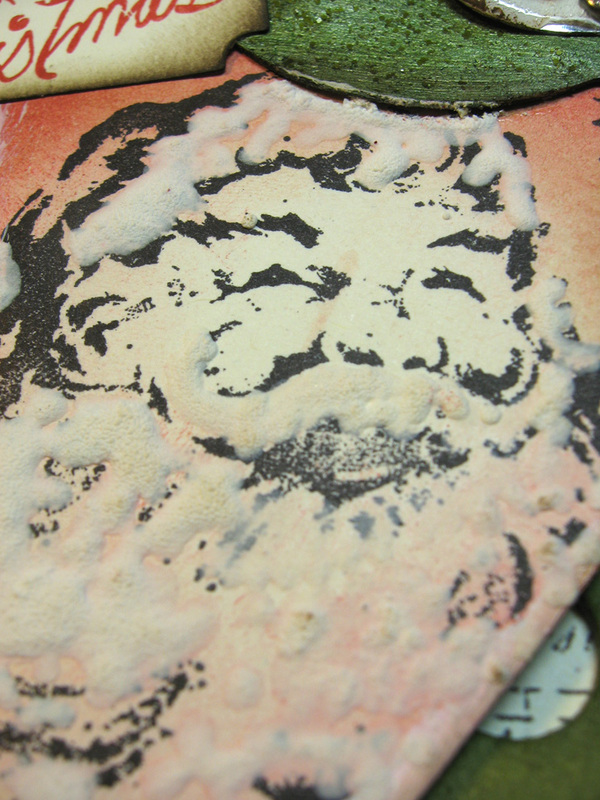 This is the first time Santa has made an appearance! This tag is fairly simple and quick, with a great technique using one of Tim's new facets, so be sure to check out his explanation on how it's done. Santa's cheeks just made me want to add just a little red to this mostly blue tag. 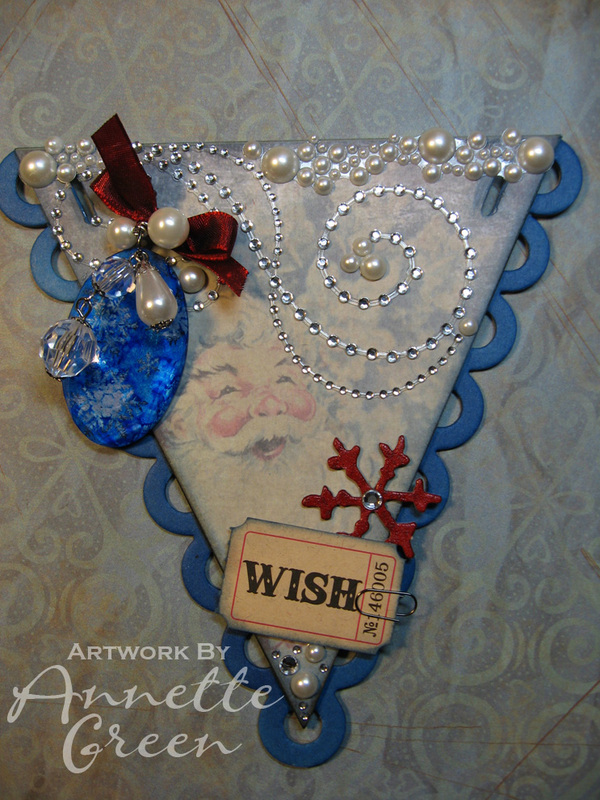 The bow on the facet was the beginning, but then I felt it needed some balance in the lower right so I grabbed the leftover red snowflake (yes, I said RED SNOWFLAKE) from my Tag #12 and stuck it under the WISH adage ticket. 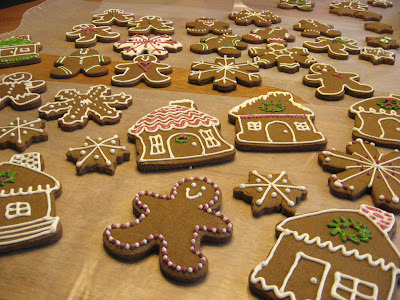 Who says snowflakes always have to be all white and snowy looking? Not me. 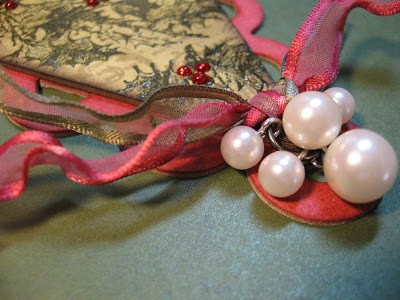 I just love how Tim busted out of that man-shell and added some bling and pearls to this tag! I found the gem adhesive flourish from Prima at the local Hobby Lobby, along with the adhesive pearl clusters by Mark Richards. 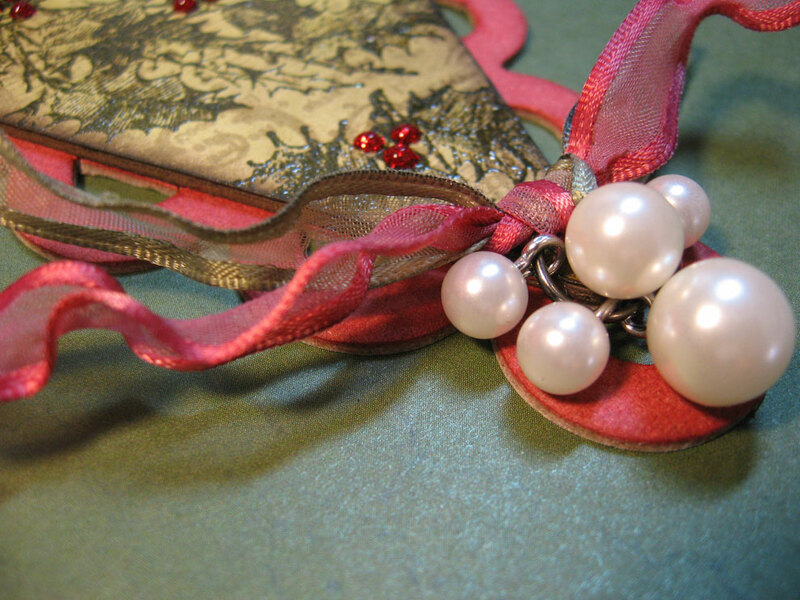 I added a few single pearls and gems by Close To My Heart to fill in spaces as needed. I'll be honest, I had a little trouble with the facet and the technique to lift the archival stamping off the back. I had to do it twice and finally decided it was good enough. Of course, Tim's is perfect and awesome. But hey, he IS the master. One last look at today's tag. Time to get in my jammies for the night and enjoy a glass of red. Goodnight and thanks for stopping by. Getting a late start tonight on my Tag #3 inspired by Tim Holtz's 12 Tags of Christmas, and I'm super tired so I will be keeping it short tonight. If you go to his blog, you'll see how he uses tissue tape on his grungeboard bird and more tissue tape to make the flower rosette in the lower right corner. Be sure to click on Tag #3 in the right hand column of his blog page. You'll notice right away that I have veered quite a bit from Tim's design this time. Since I made my Tag #2 a green one and my "tags" are going to be pennants in a row on a banner, I didn't want the same color scheme side-by-side. 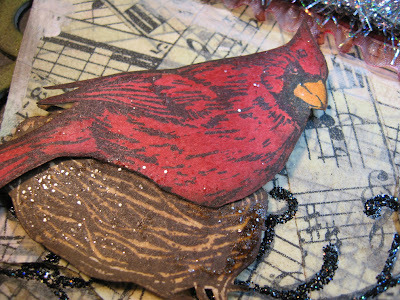 And since I don't have the bird die that he used, I had to stamp one instead. But I still wanted to try using his tissue tape, of which I have several different rolls and haven't opened any of them yet. 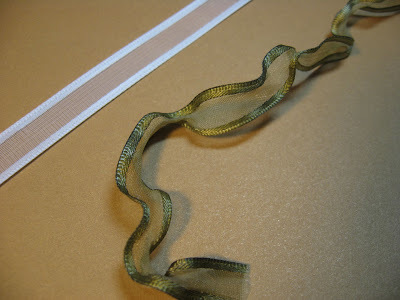 So I covered my "tag" entirely with the tissue tape, flipped over the tag and trimmed off all the excess. This will now serve as my background. 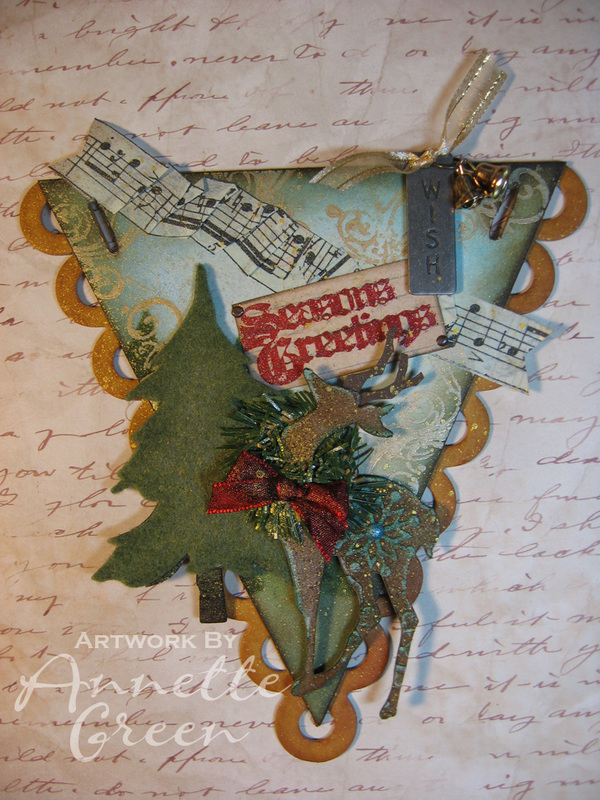 I used Vintage Photo and Walnut Stain, plus a little Forest Moss distress inks over the top. Back to the cardinal. 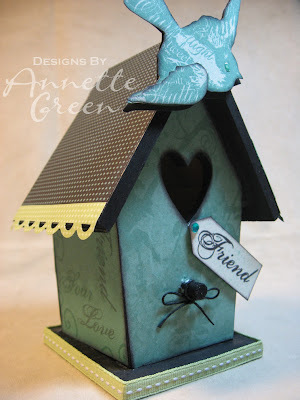 I used this great stamp called "Harmony" from Close To My Heart for the bird and the nest. I rubbed some Distress Stickles (Rock Candy) over the top. 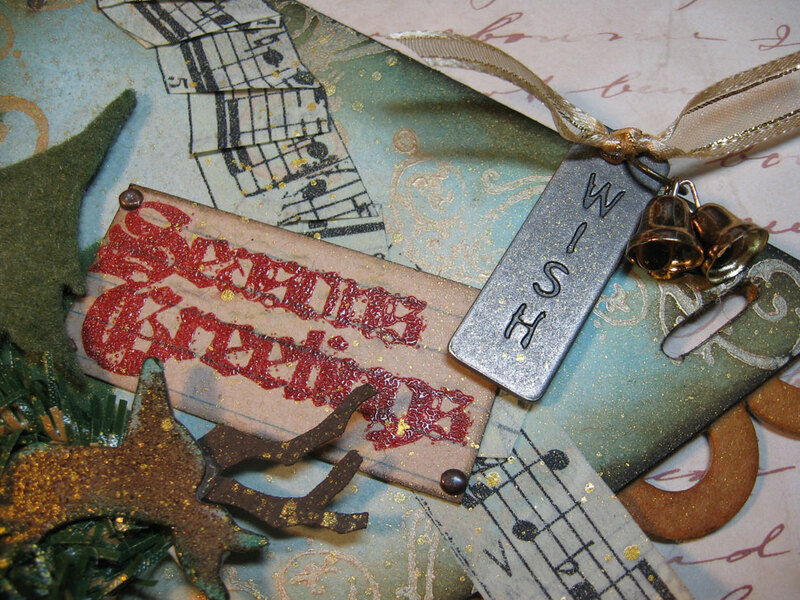 In the background, I didn't have Tim's tree branch stamp so I substituted this branch-like flourish from "Adorn-able" (also CTMH) and added some Black Diamond Stickles to make it stand out. 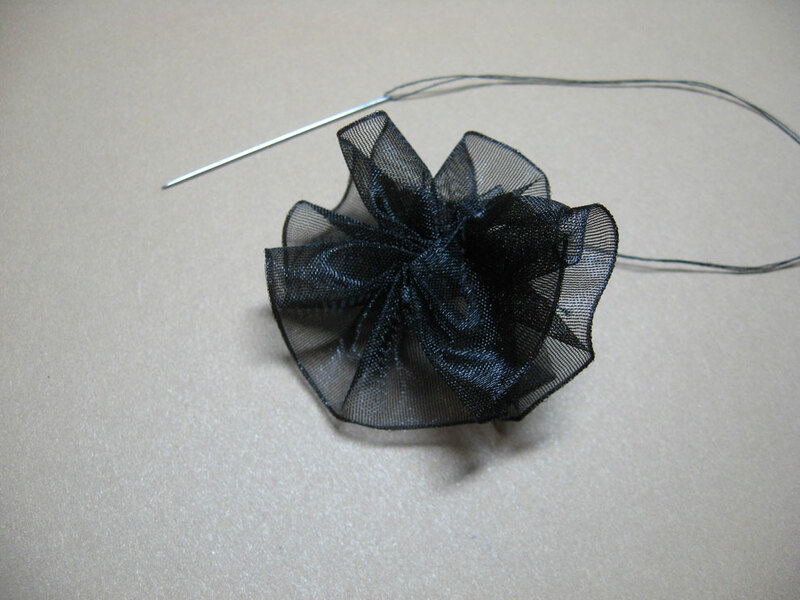 pulled and gathered so that it curled up into a flower shape. 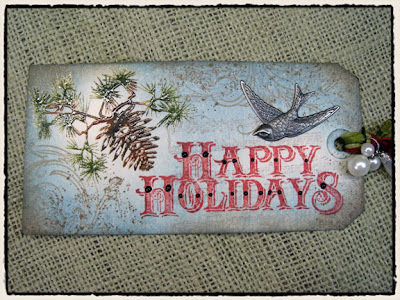 Here's another look at my tag. Quite a different twist, wouldn't you say? Thank you for taking the time to stop by. 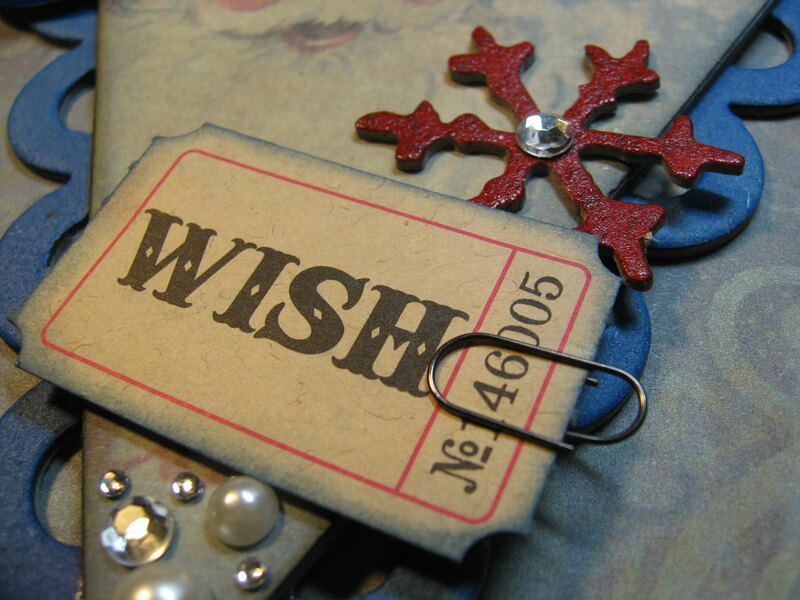 I'm looking forward to making my final three tags I have left. Stay tuned! Yesterday just got away from me, I guess. I just couldn't find the time to make my Tag #2. Since my mother-in-law's death last Saturday, my brother-in-law has been in town, my father-in-law needs to get out and about, and cremation details needed attending to, so that has taken up some time these past few days. But never fear, I am back to my Tim Holtz-inspired 12 Tags of Christmas. Although I am working on Tag #2, I have already completed Tags 7 - 12 so be sure to go back in my older posts and check those out. 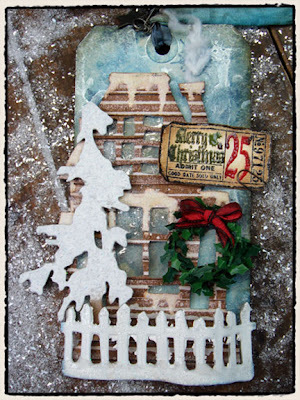 You'll want to go to Tim's blog and click on the link to his Tag #2. He takes us step-by-step and shows us all kinds of extra techniques and bonus projects. My post will simply show you some things I did differently. A more horizontal design this time. 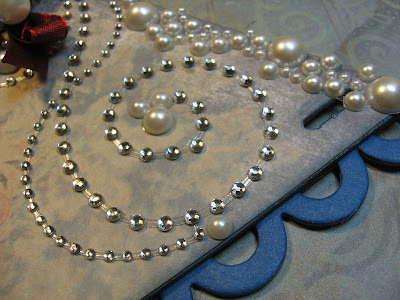 Tim created a custom ink pad from Cut & Dry Foam that you simply MUST check out. I've got to find some of that stuff and give it a try. (my friend DiAnn ordered some online, so I'll have to find out exactly where she got it.) It's pretty cool! You might notice right off the top that Tim's tag was more of a blue color scheme. But I opted for a more traditional plan. 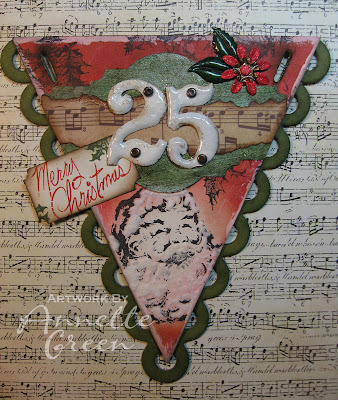 The triangle shape of my pennant forced me to alter the arrangement of the stamped elements, but that is part of the fun. To be inspired, rather than to copy. I decided to emboss the Happy Holidays to make it stand out a big more. I like how Tim strategically places a highlight behind something he wants to emphasize in his tag. I did this behind the words Happy Holidays where Tim did this behind his stamped pinecone and pine boughs. My photo looks a bit green here, but if you look at my completed tag image above it, you'll really see this highlight areas I'm talking about. 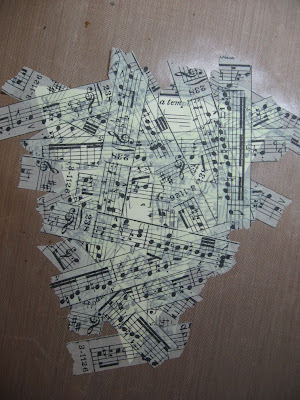 I want to back up a second and show you the layers that each tag is made up of. 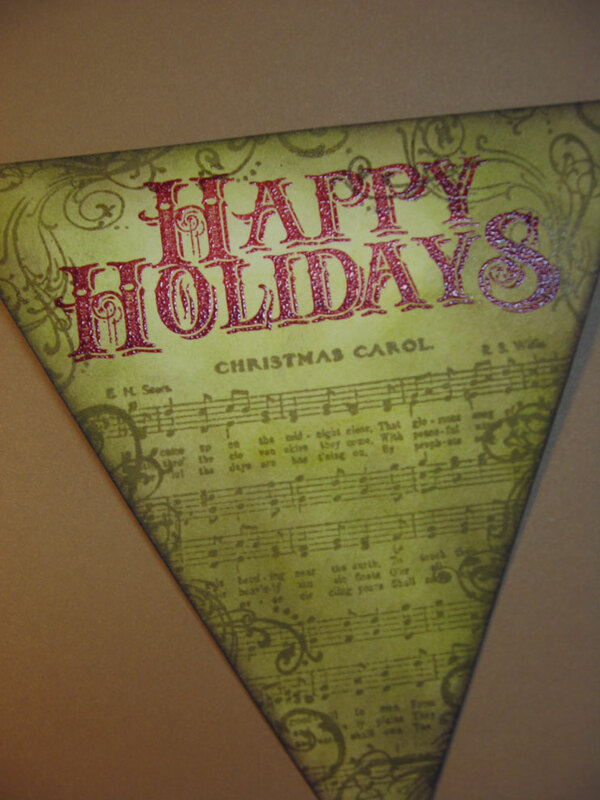 You might not have realized this is a two-layer chipboard pennant. I simply used a good strong glue to sandwich them together. 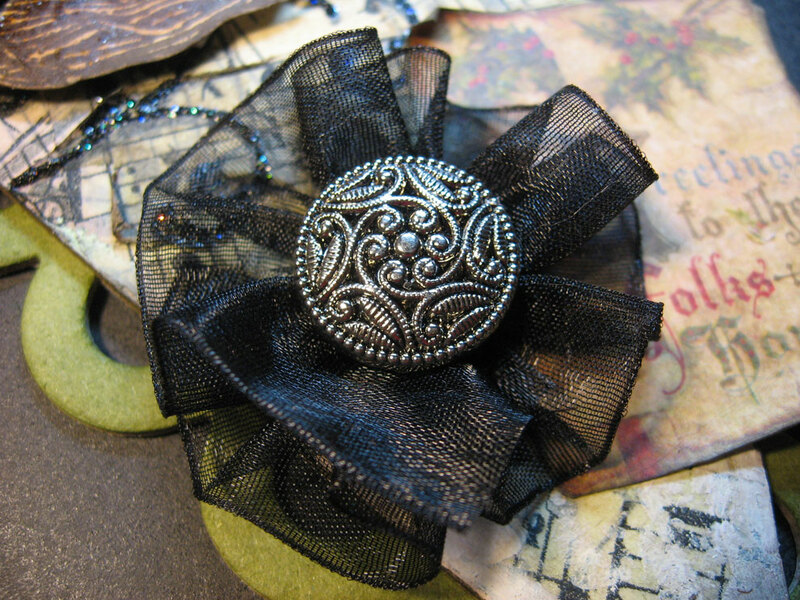 The two layers are nice because you can add brads and other things to the top layer and since it's sandwiched, you don't have unsightly prongs on the back side. Here was a very serendipitous moment! I didn't have the ribbon that Tim used, so I grabbed some satin-edged white organdy ribbon and inked it up with Forest Moss ink on both sides. I wanted to be sure the color was set, so I put the heat gun to it and WHOA it started to shrivel and shrink up. Cool! 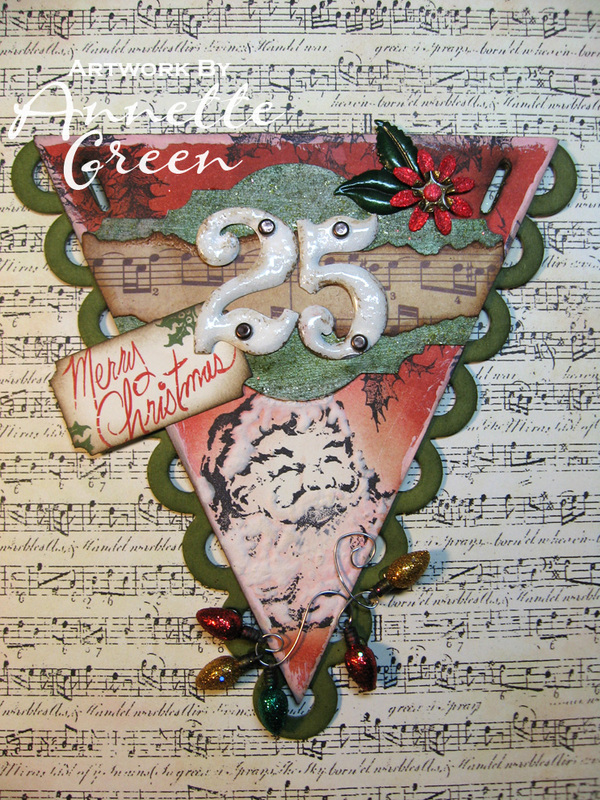 So I did this with both red and green inks to two pieces of ribbon. 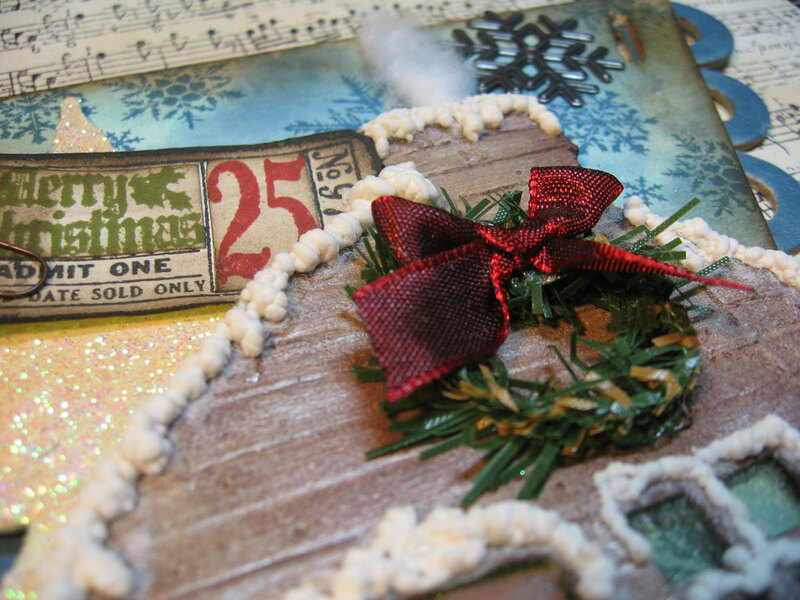 I didn't have Tim's pine bough stamp or pinecone, so I decided to use the holly stamp from his Holiday Wishes stamp set instead. I stamped it in Forest Moss and clear-embossed it. 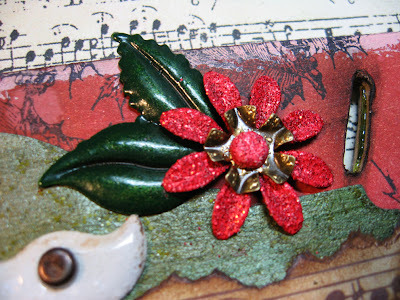 I added some Holiday Red Stickles to the holly berries for a finishing touch. Thanks again for popping in today and checking out my artwork. I'm off to have lunch with hubby now. Enjoy your day! Yep, you read it correctly. I am back to the beginning with Tag #1 from Tim Holtz's 12 Tags of Christmas. Of course, mine aren't exactly "tags" but that's the challenging and fun part. As always, amazing. Remember, if you go to Tim's blog you'll see that he takes us step-by-step through each tag, explains the products he used, and even includes bonus projects and technique videos. When you go there, you'll have to click on the Tag 1 link on the right-hand column of his page. 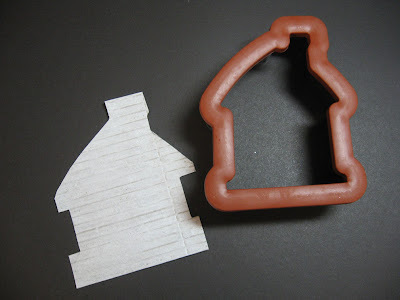 Yep, a cookie cutter. I was happy to already have Tim's "notebook" texture fade so I ran the grungeboard through my Big Shot, then traced and cut out the cabin. I didn't go through the steps Tim did cutting out all those strips. 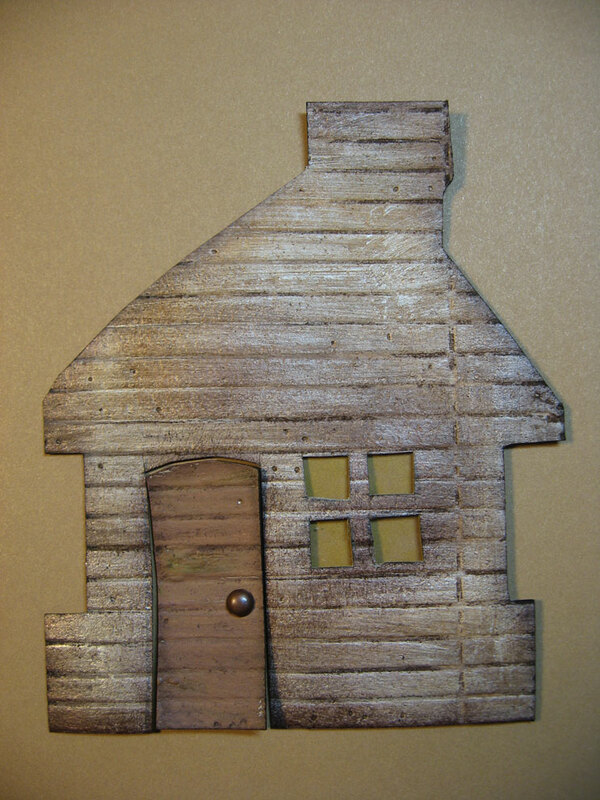 I just textured it and cut it out then hand-cut some windows and a door. I saved the cut-out door and painted it a little darker, added an antique copper brad for a doorknob, and inked the edges. For the cabin, I applied some Snow Cap white paint, distress inks, and also put a piece of tinted plastic behind the window. I also did NOT have the "on the fence" on the edge die of Tim's, so I made my own from grungeboard. You'll notice I didn't bother with all the little cuts between the slats. 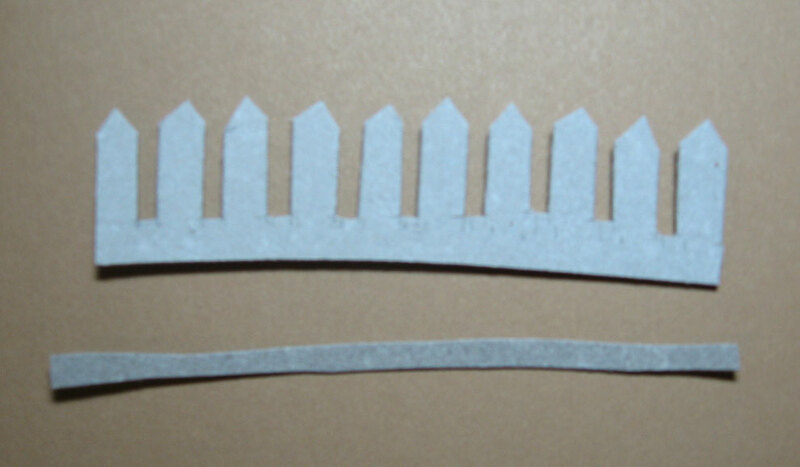 Instead I simply cut one long piece that will lay behind the pickets. 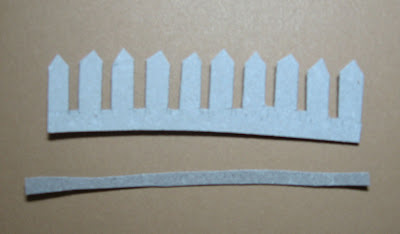 With some Snow Cap, then some ink distressing, it looks like a rickety picket fence. You can see this best in my photo of the entire tag above. Tim's showed us his technique for created a custom, colorized ink pad from Cut & Dry Foam. (by the way, if you can find this stuff in the Central Florida area, please clue me in.) I didn't have access to this product, so I decided to paper piece instead. 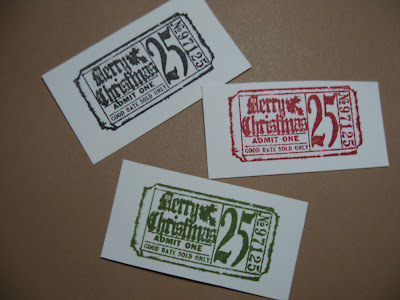 I stamped the ticket image three times. 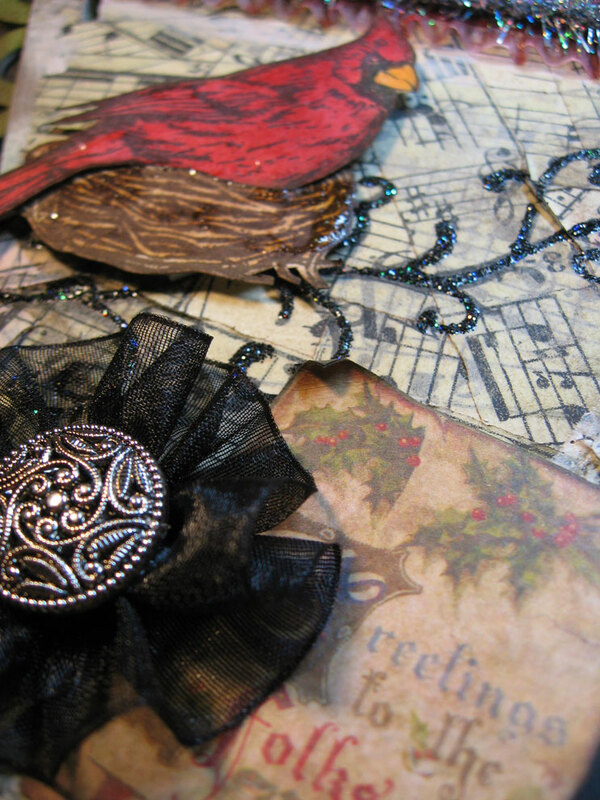 Black, red and green. I cut out the 25 from the red, Merry Christmas from the green, and used the black stamped ticket as my base. I used Walnut Stain distress ink to give it that wonderful, worn vintage look. 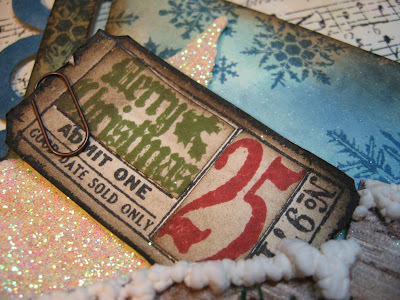 And see the glistening tree behind the ticket? 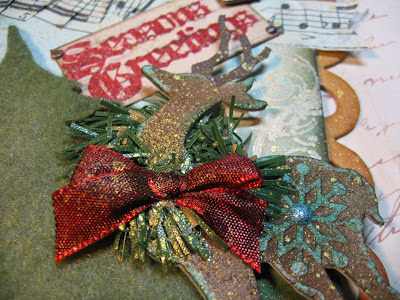 That's from a Sizzix die. I cut out grungeboard, painted it white and while the paint was still wet, I sprinkled a ton of Prisma Glitter all over it. My little wreathe was fashioned from a straight piece of wired pine from the local Dollar Tree. (Thanks for the tip, Lisa R.!) And see that "snow" on the cabin? It's this cool stuff called Liquid Applique which I got from Close To My Heart. 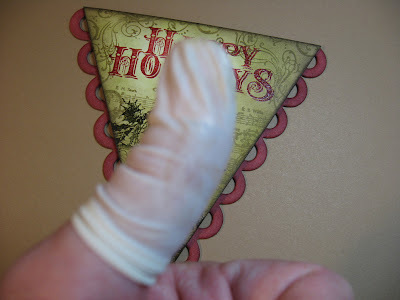 You squeeze it out, let it set, heat it up and it puffs like crazy! 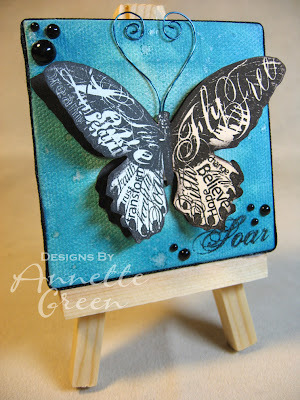 Here's a look at my tag again. 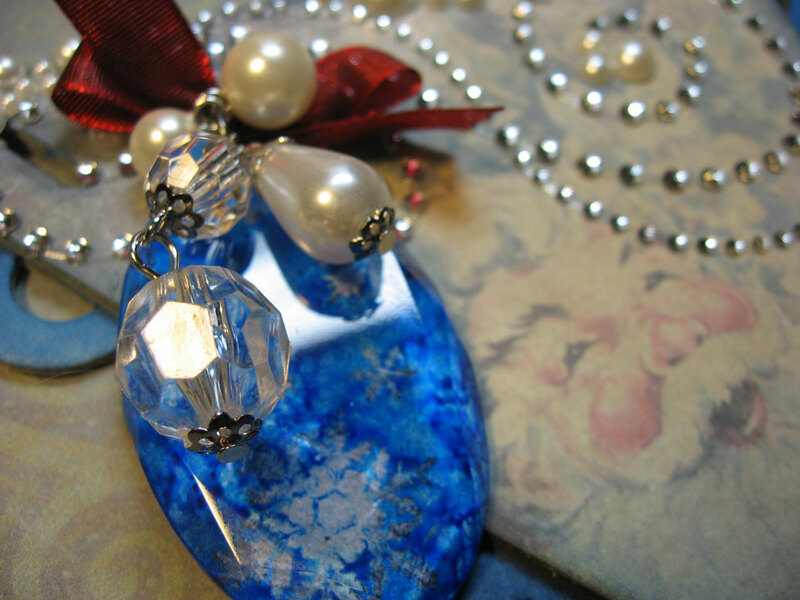 Be sure to click on it to get an even closer look at the details. Thank you again for taking the time to stop by. I'm off to decorate our Christmas tree - finally!